The blood-feeding, dung-breeding buffalo fly is a serious pest of cattle and is a vector of a number of bovine diseases. It is most abundant during the moist summer season and scarce during the dry winter season in northern Australia, but it is spreading further south. It was accidentally introduced near Darwin on buffalo from Timor in 1838 and quickly established on local cattle and buffalo. It spread slowly from Darwin to the Northern Territory–Queensland border (by 1928), from where it spread quickly to the east coast (reaching Bundaberg by 1946) and has progressively moved south since then, reaching Bororen, Queensland, in 1974 and Coffs Harbour, New South Wales, in 1982. It is now a pest in the New England Tablelands, northern New South Wales. Unfortunately there is little evidence that dung beetles alone can effectively control the buffalo fly. Control of buffalo fly in Australia relies primarily on chemicals, although fly traps have been used successfully in some circumstances. Unfortunately, the fly has developed resistance to some insecticides, making them all but useless for fly control. The buffalo fly is considered to spread three diseases (pink eye, herpes and filiariasis) among cattle in northern Australia. 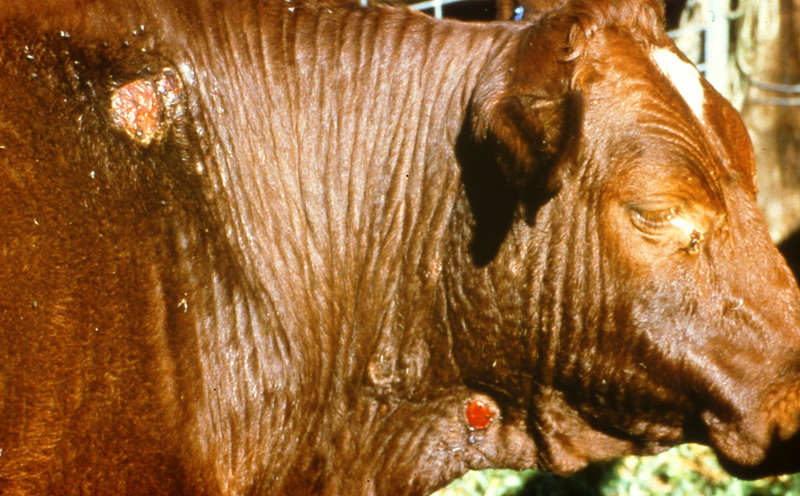 Stefanofilaria is the most obvious of these, causing the raised skin lesions commonly seen of the head, neck and sternum of cattle. The buffalo fly transmits the infective stage (microfilaria) between animals. The prevalence of lesions on cattle appears to be linked to the abundance of the buffalo fly and ranges from less than 5% in south-eastern Queensland to more than 95% in Cape York. Adult buffalo flies have biting mouthparts and feed on the blood of cattle, buffalo, horses and other mammals. 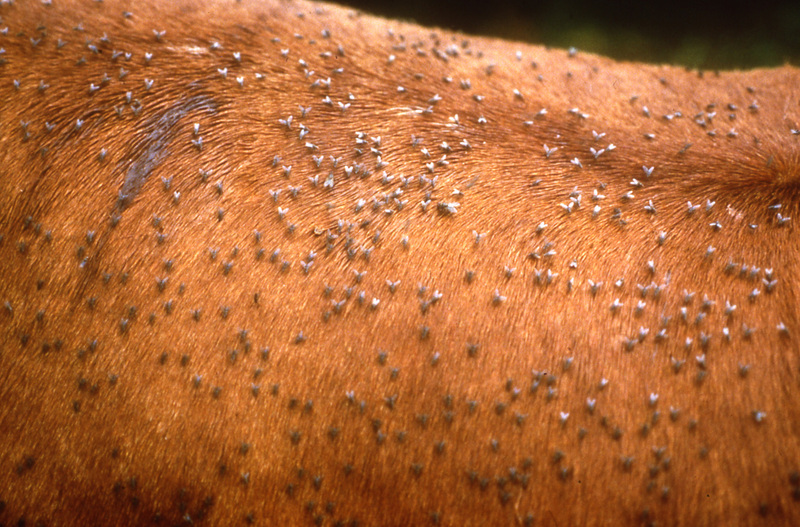 Flies regularly move between cattle within a mob as the cattle attempt by tail and head movements to dislodge their pesky attendants, and tend to accumulate on bulls and dark-coated animals. The fly breeds well in a variety of dung types (such as cattle and buffalo) and, without biological control, huge numbers can be produced. For example, a large cow pad can produce hundreds of flies, each of which can live for some weeks, and so when the fly is ‘bad’ cattle may each ‘carry’ 5000 flies or more. This constant irritation reduces growth, as well as damaging hides. The adult buffalo fly perches on the hide of its host (day and night), feeding up to 20 times in 24 hours. Once a batch of eggs has been developed, the female will follow a fresh dung pad to the ground and deposit her eggs around the creviced edges of the pad. In normal conditions (that is, in warm summer) eggs will hatch in about 20 hours. Fly larvae feed on dung juices for some days and then burrow into the soil under the pad, where they pupate, and emerge as adults some days later to seek a host. Numbers of species of dung beetles and the predators of fly eggs and larvae (histerid beetles and phoretic mites) have been introduced to northern Australia in an attempt to achieve biological control of the buffalo fly. This has not yet been successful, whereas biological control of the bush fly by dung beetles has been an outstanding success in the wetter regions of southern Australia. In many situations in southern and northern Australia, dung beetles have had a similar impact on dung. Despite this, the buffalo fly appears to be as abundant as ever, except in some rare situations where persistent and massive dung burial has induced a temporary decline in their numbers. This conclusion is based on observation of fly numbers in Queensland and the Northern Territory over the past few decades and on CSIRO data (collected for more than 10 years in Rockhampton, Queensland) about the numbers of buffalo flies on cattle and the corresponding abundance of dung beetles. This analysis suggests that only at times of very high beetle abundance is the competition for dung juices between buffalo flies and dung beetles sufficient to reduce the breeding and survival of this pest fly. The current failure of introduced dung beetles and predators/parasites to achieve obvious biological control of the buffalo fly makes us question whether effective biological control is possible. To answer this question, a group of CSIRO scientists, led by Dr Bernard Doube, studied the biology of the African buffalo fly in South Africa, with a view to identifying biocontrol agents that could be introduced to Australia. African buffalo flies feed on Cape Buffalo in game reserves in South Africa, and breed in dung. We studied their natural enemies in order to select biocontrol agents for the buffalo fly in Australia. 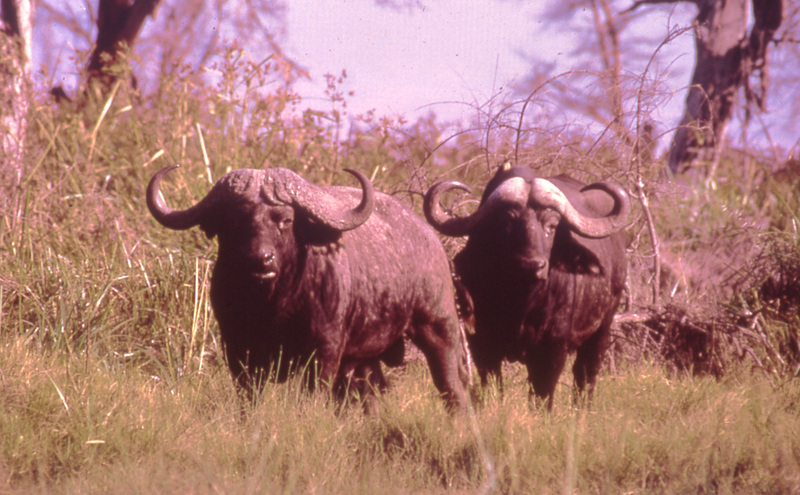 The African buffalo fly is quite scarce on cattle and buffalo in southern Africa, indicating that it may be under effective biological control. For example, in the Transkei, in summer in 1982, a 10-day survey found that cattle carried an average of 25 buffalo flies when no chemicals were used to control ticks. In similar situations in Australia buffalo fly burdens can be 1000 or more per animal. In most of South Africa the African buffalo fly had been exterminated by the frequent use of fly-toxic chemicals for tick control, and so conventional farms could not be used to identify biocontrol agents. However, the fly was present on buffalo in the game reserves in southern Africa. Over several years in the 1980s, natural populations of the African buffalo fly were studied and the levels of biological control in African dung pads were compared with those of the buffalo fly in Australia. A very clear result emerged. In Africa the level of biological control of the buffalo fly in dung pads was substantially greater than that observed in Australia and the fly burdens on buffalo were correspondingly lower than fly burdens on cattle in Australia. This suggests that there are indeed effective biocontrol agents in dung pads in southern Africa that could be introduced to Australia to improve control of the Australian buffalo fly. The candidates are predatory beetles and mites, more dung beetle species, and possibly parasites.